Cute and cuddly or fierce and fiery. Furry, feathered or scaly whatever your preference today we celebrate animals in all their many shapes and sizes. 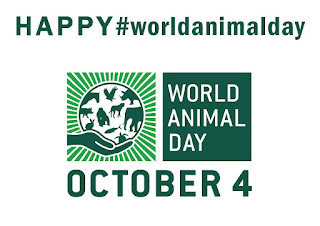 The mission of World Animal Day is to raise the status of animals in order to improve welfare standards around the globe. Building the celebration of World Animal Day unites the animal welfare movement, mobilising it into a global force to make the world a better place for all animals. It's celebrated in different ways in every country, irrespective of nationality, religion, faith or political ideology. Through increased awareness and education we can create a world where animals are always recognised as sentient beings and full regard is always paid to their welfare. The idea of World Animal Day was originated by Heinrich Zimmermann, the German writer and publisher of the magazine Mensch und Hund/Man and Dog. He organized the first World Animal Day on 24 March 1925 in Berlin and moved it to 4 October for the first time in 1929. Share a selfie*, make a pledge, go to an event, make a difference, be part of something special. *Here's Office Dog Flora's Happy World Animal Day selfie!